Definitely one of my favorites from the series. It was so worth getting up those stairs XD both Paige and Ted had to help me get down once we were done. I'm so in love with the new wig. Ten times better then the older one. Maybe it was a blessing the first one got messed up in the car. Oh wow, this is awesome! I really like the multi-colors going on in the wig! So much detail too, great job! 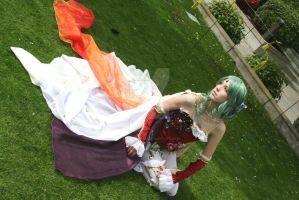 very beautiful Cosplay Terra ! Wow. 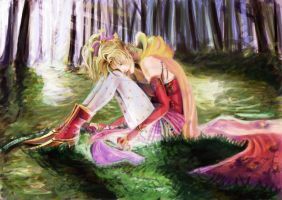 Terra. That looks incredible! "Maybe it was a blessing..."
Somehow i think the boots make it hard to climb stairs. oh the wig! It was! The new one looks AND fits better. I didn't have to squeeze it on my head! Very pretty! And I love all the pretty colors!!!! Well now you do know! Great costume and shot! I really like your new wig, it's pretty!